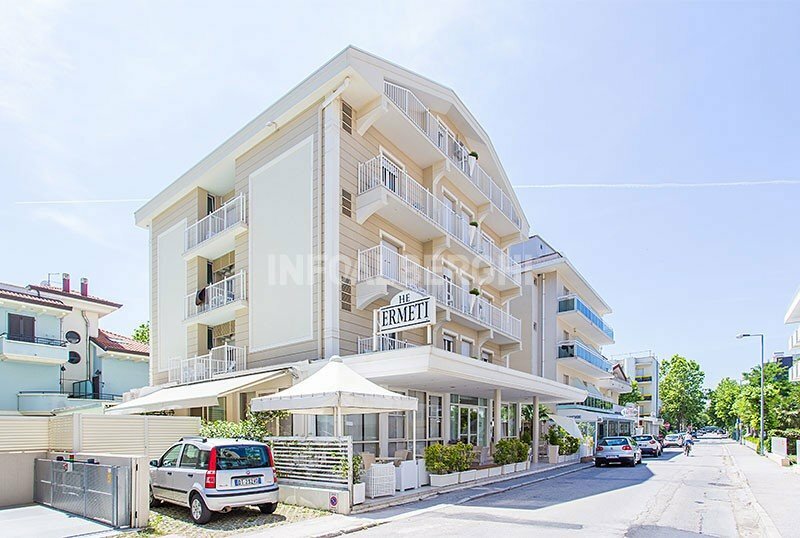 The Hotel Ermeti is a three star hotel in Riccione family managed near the sea, with parking and free WI-FI, garden and outdoor games for children. Free admissions to the Beach Village. Allowed animals of all sizes. The hotel is located a few steps from the beach of Riccione and a ten minute stroll from the Beach Village. Balcony, sea view on request, air conditioning, ceiling fan, WI-FI, satellite TV and digital terrestrial LCD 28/32 ", safe, telephone, minibar, renovated private bathroom with shower and complimentary toiletries, hairdryer, possibility of breakfast in the room. FAMILY : available connecting rooms and solutions for families. Garden with games for children, open-air porch, elevator, reading room with newspapers, living room, American bar, satellite TV, newspapers, free bicycles, weekly aperitif, theme nights. Paid laundry. PARKING : uncovered, fenced, illuminated and adjacent to the hotel (subject to availability). WI-FI : present throughout the structure. AIR CONDITIONING : available both in the room and in the common areas. CONVENTIONS : beach, amusement parks, discos, gym, swimming pool, spa, waterslide (free admission to the Beach Village) and organized excursions. PETS : pets of all sizes are allowed. BREAKFAST : international buffet breakfast with homemade desserts. LUNCH AND DINNER : choice between various menus based on meat and fish accompanied by a vegetable buffet and, at the end of the meal, dessert. Cuisine inspired by the Romagna tradition with attention to the genuineness of the raw materials. Possibility to have a meal in the air-conditioned dining room or on the outdoor patio. Water and wine included in the all-inclusive formula. In the hotel : games in the garden, strollers on request, indoor playground area, bottle warmer, afternoon snack, pediatrician on request. In the room : cot. At meals : table seats, baby food and baby menu. On the beach : live entertainment, baby sitter, children's pool. The Hotel Ermeti has an agreement with the Bagni n.124, n.135 and n.136. Available games for children, entertainment and area for dogs, swimming pools and wellness center at the Bagno n. 135. Prices are per day per person with a minimum stay of 3 days. TOURIST TAX: not included in the price list. Book your stay by the 30th April 2019, you will receive a 5% discount on the list price. Your beach holidays will be really convenient. Take advantage of this opportunity, call now! In addition to saving, the wait will be shorter. Save 5% on the amount of your stay at the beach by booking by 04/30/2019. Your beach holidays will be really convenient. Take advantage of this opportunity! In addition to savings, the wait will be shorter !! Book your all inclusive holiday at the beach in Riccione !! We are a few steps from the sea and Viale Dante. Our 3-star hotel in Riccione offers all-inclusive weeks at really affordable prices! Family-run Hotel Ermeti welcomes you with its warm atmosphere to give you a fabulous holiday.